The Library has bought a very rare book by a Welshman who was present when the explorer Captain James Cook was killed. David Samwell was born in Denbighshire in 1751. He had a particular interest in English and Welsh literature and in the Welsh cultural movements of his time, and wrote a great deal of poetry in Welsh and English. He was President of the Gwyneddigion Society in 1797. The Library owns his manuscripts, including correspondence with Iolo Morganwg. 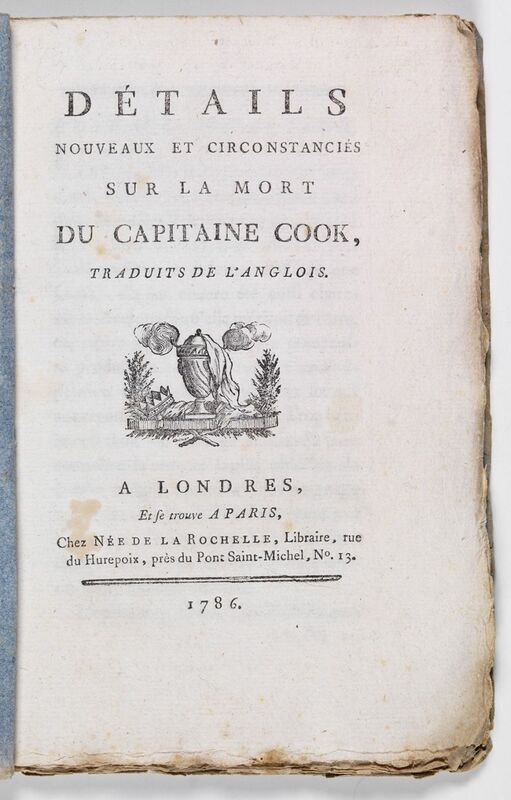 Title page of "Détails nouveaux et circonstanciés sur la mort du Capitaine Cook"
First page of "Détails nouveaux et circonstanciés sur la mort du Capitaine Cook"
Samwell sailed with Captain Cook as “surgeon’s first mate” on the Resolution in 1776 and witnessed Cook’s death in a skirmish with natives in Hawaii in 1779. 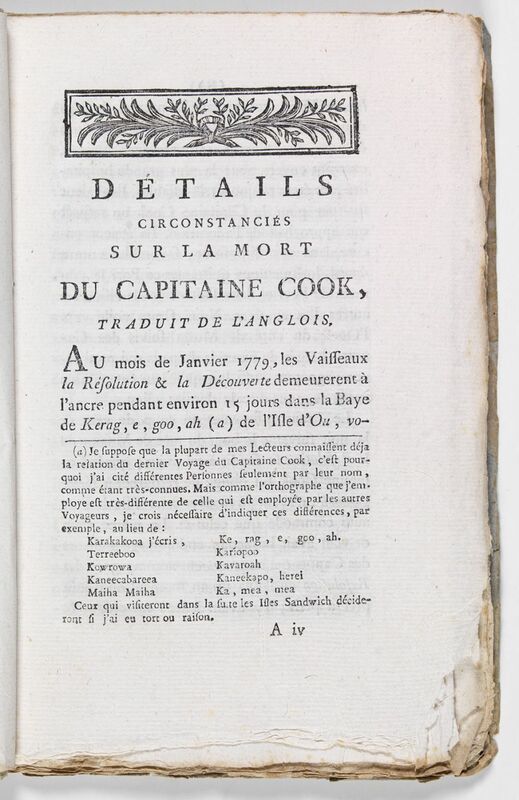 He wrote a full account of the event, and after his return to England published it in 1786 under the title A narrative of the death of Captain James Cook. The Library already has two copies of this. But in the same year, a French translation was published with the title Détails nouveaux et circonstanciés sur la mort du Capitaine Cook. 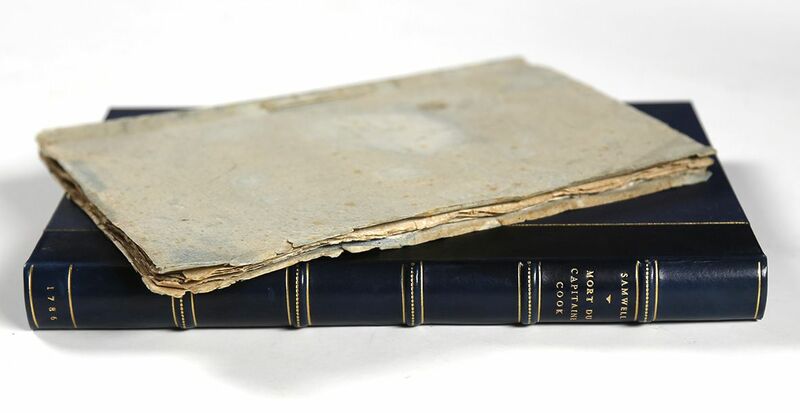 This is particularly rare, with only three known copies in other libraries throughout the world, so when a copy came up for sale we took the opportunity to add this important item to the collections of the National Library of Wales. 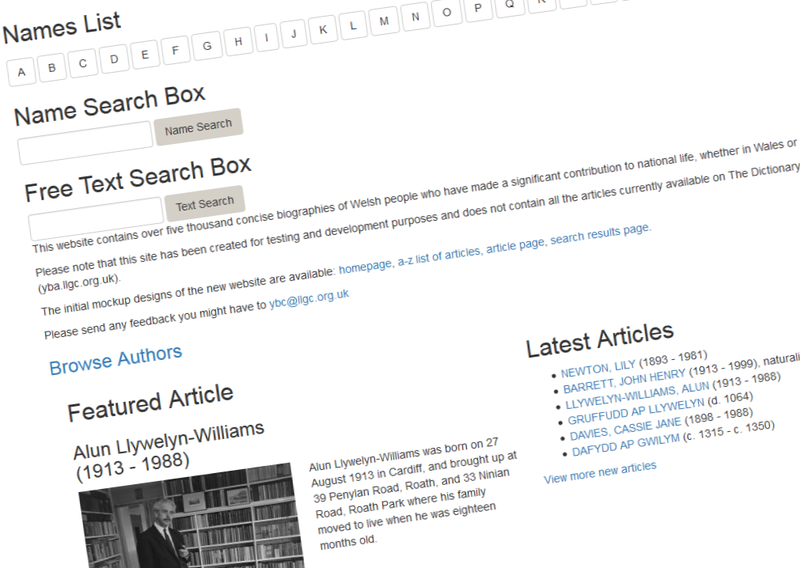 The Library has given access to the the Alpha version of the new Dictionary of Welsh Biography website, giving us a first glimpse of the changes we can expect to see when it is launched in the autumn. Here is some of the background to the project, a summary of what you will find in the Alpha version, and how you can help with the development of the new website in the coming weeks. 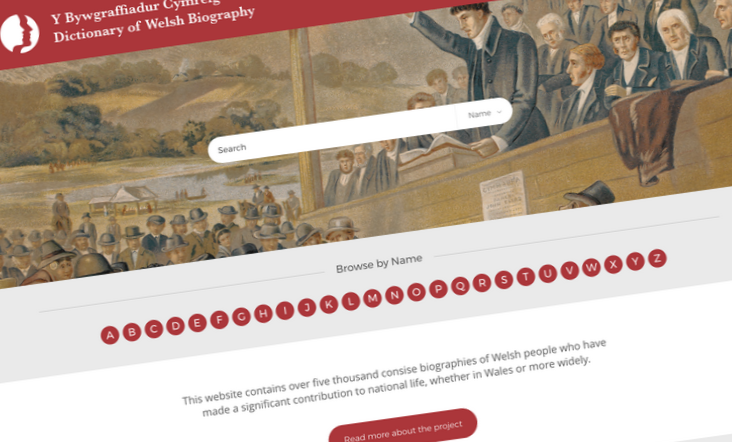 The Dictionary of Welsh Biography (DWB) features nearly 5,000 biographies of men and women who have made noteable contrubutions to life in Wales and beyond. The Dictionary first appeared in print volumes, and their content has been available digitally since the launch of the website in 2003. Through collaboration between the Honorable Society of Cymmrodorion, the Centre for Advanced Welsh and Celtic Studies and the National Library of Wales, new and revised articles are now added to the resource since it turned digital. Browse through the articles by subject’s surname in alphabetical order. Articles are written in text, with some illustrated with images of the subject. The value and potential of the DWB as a resource was stated in the Library’s Strategic Plan for 2017-2021, The Nation’s Memory: Informing the Future, and has led the project to update and improve the website. The delivery of the project has been made possible with the financial support of the Colwinston Trust and the National Library, and we aim to launch the new website in the autumn. What’s different about the Alpha website? The purpose of the Alpha website is to ensure that the functions are working as they should. A new design hasn’t yet been applied and not all of the articles on the current website have been added to it. The ability to filter search results by gender, article author, thematic category and language. The ability to browse article authors in order to read their contributions. More prominence on the home page to new articles. What other features can we expect to see? Another aspect that is essential to the new website is ensuring that it adapts effectively when accessed on mobile devices. What about the design of the new website? The design for the new website is currently in development. Links to the initial design (seen below) can be found on the homepage of the Alpha version. The intention is for the design to be more striking visually and based on the familiar red colour. Is everything is working as it should, or as you would expect? What else would you like to be able to do with the DWB website? You can send your comments, suggestions and questions to ybc@llgc.org.uk or contact us using the @WelshBiography Twitter account. Did you know that a large collection of papers relating to the world of the bee is held here at the Library? 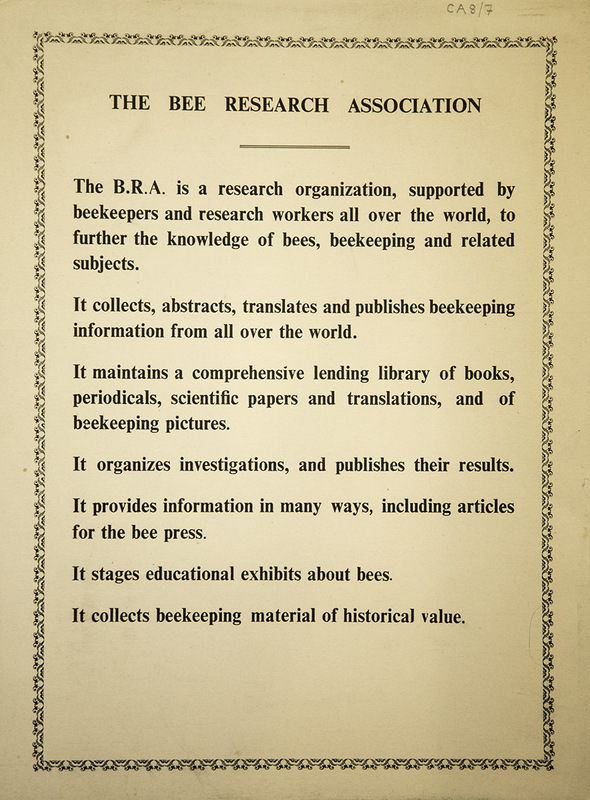 The International Bee Research Association was formed in 1949, originally as the Bee Research Association, and its archive also incorporates that of the earlier Apis Club, (active 1919- 1951). The Bee Research Association was established in Hull by bee scientist Dr Eva Crane, before eventually being based in offices in North Road, Cardiff. The aim of the association, which is still active, was to promote the value of bees by providing information on bee science, and is now one of the world’s foremost authorities in the world on bees and beekeeping. 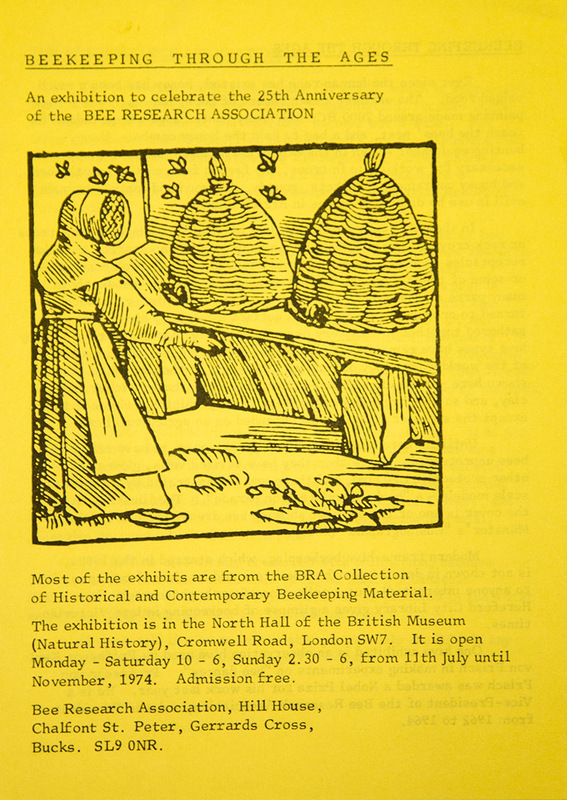 The IBRA archive is wide ranging, consisting of documents covering the period c.1876-2004 and also including those relating to the publication of IBRA’s quarterly journal, Bee World. Many of the earlier records belonged to the Apis Club and the British Beekeepers Association, and include correspondence, reports, minutes, and conference papers. Of particular interest is the IBRA archive’s large collection of research papers which date from 1880-1988, charting the development and changing priorities of bee research over the course of a century. 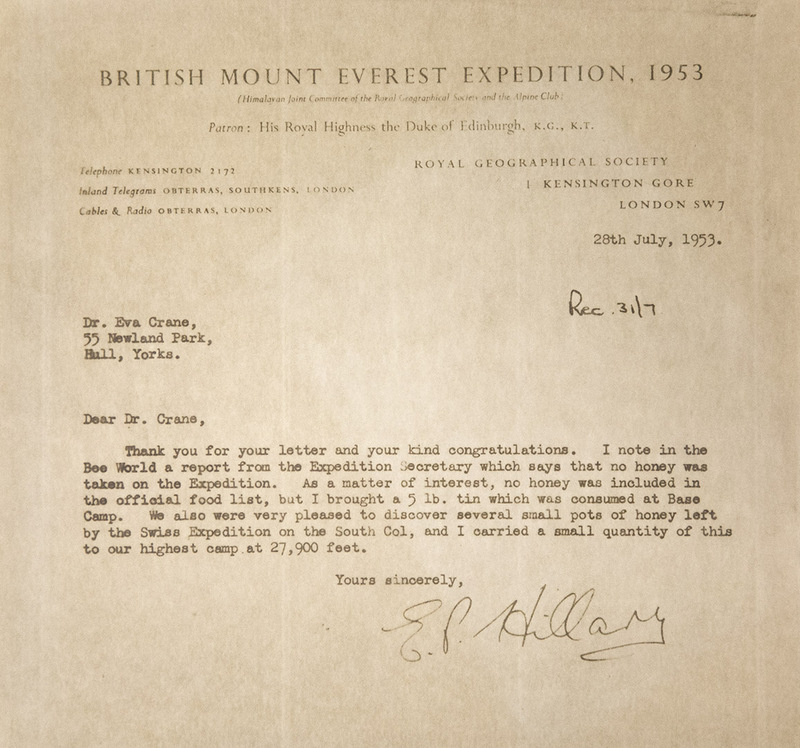 The collection also contains some more unique items, a notable one being a copy of a letter to IBRA founder Dr Crane from climber and enthusiastic beekeeper Sir Edmund Hillary. Hillary notes that during his successful ascent of Everest in 1953, the team was very pleased to discover several pots of honey left on the mountain left by a previous expedition, as it was sadly not on the list of official expedition supplies. The IBRA archive can be found and requested through the Library’s catalogue. The Welsh Assembly Government has designated 2018 the ‘Year of the Sea’ and fittingly sea charts and other matters maritime will be topics of the day in ‘Charting the Seas’ the forthcoming Carto-Cymru Symposium at the National Library on 18th May. Consequently this is an appropriate time to recall the life and labours of Lewis Morris, Wales’s most esteemed hydrographer. Lewis Morris (1701-1765) was a member of the celebrated family known as the ‘Morrisiaid Môn’, or the ‘Morrises of Anglesey’ who are remembered for their cultural endeavours. Lewis Morris was a polymath, being not only a hydrographer, but also a land surveyor, customs officer, antiquary, literary scholar, philologist and mineralogist. His work in land and marine surveying has received scant attention until recently. 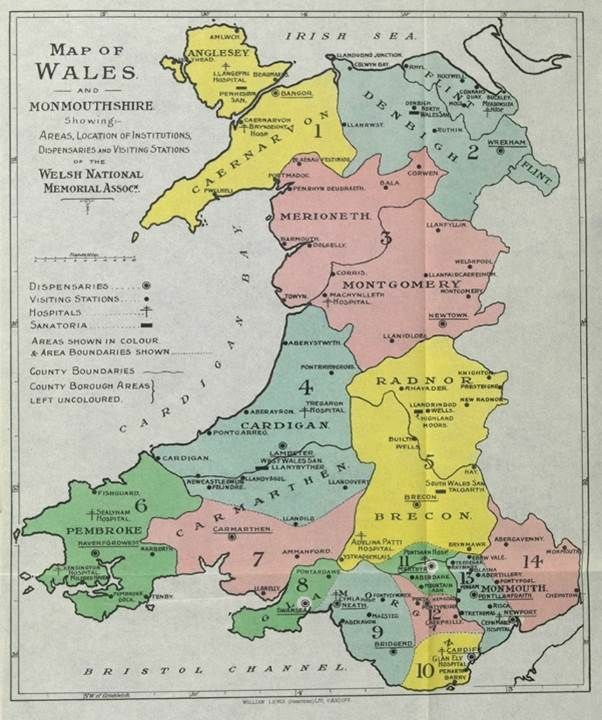 Morris’s marine survey of the Welsh coast, undertaken with very little official support, was a supreme pioneering achievement, especially for a self-taught hydrographer. It is for this survey that he is now recognized as one of the most eminent of British cartographers. Morris was raised near Dulas Bay in Anglesey and living near the sea, he would have observed vessels engaged in coastal trade or on passage to and from Liverpool and witnessed or heard about shipwrecks around the region’s hazardous coasts. He became an estate surveyor and then a customs official on Anglesey and listened to seamen bemoan the inadequacies of contemporary local charts. In the interests of safer navigation Morris decided to embark on the immense task of surveying the Welsh coast, despite never having been formally trained as a marine surveyor. Welsh chart making had been neglected and shipping casualties were frequent. The poor condition of Welsh roads meant that coastal sea transport was more common at this time. In 1734 Morris unsuccessfully placed his proposals before the Lords Commissioners of the Admiralty, but both the Admiralty and the Customs Commissioners refused him a survey vessel and he was obliged to hire one, at his own expense. Morris embarked on his venture at Beaumaris in July 1737. Further complications and setbacks ensued and only in 1748, with an economic upturn following the war with France together with Admiralty encouragement were his charts published. Morris’s large general chart showed the coast from Llandudno to Milford Haven and twenty-five of his harbour plans were published in Plans of harbours, bars, bays and roads in St. George’s Channel, a small volume which sold well. All of his charts were a significant improvement on earlier ones and provided a wealth of information on local conditions and hazards. These works preceded improved charts from Admiralty surveys by about seventy years. Morris’s son William revised and extended the general chart in 1800 to show the coast from Liverpool to Cardiff and his enhanced volume published in 1801 contained additional plans of harbours which had often increased in importance during the intervening years, such as Liverpool, Amlwch, Aberaeron, New Quay, Carmarthen Bay harbours, Burry, Swansea and Dublin. We’ve joined in the Christmas festivities this year by preparing an advent calendar for our Twitter, Facebook and Instagram followers. Every day between now and Christmas day, we’ll be sharing daily treats from the Library’s collections and services. 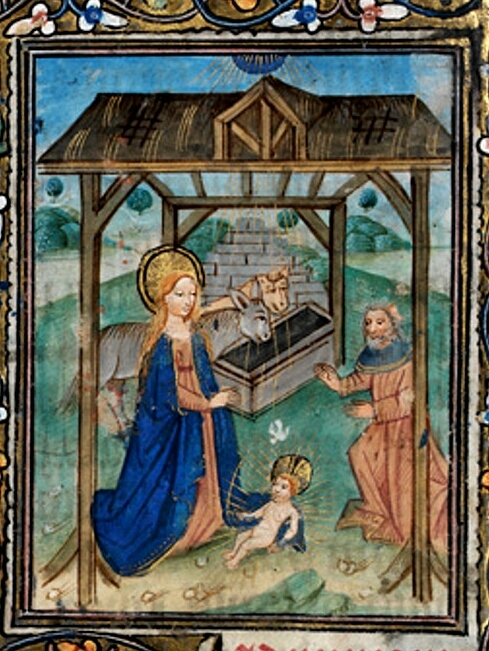 Our first treat is this beautiful image of the Nativity from the ‘De Gray’ Hours, which dates back to the beginning of the fifteenth century. 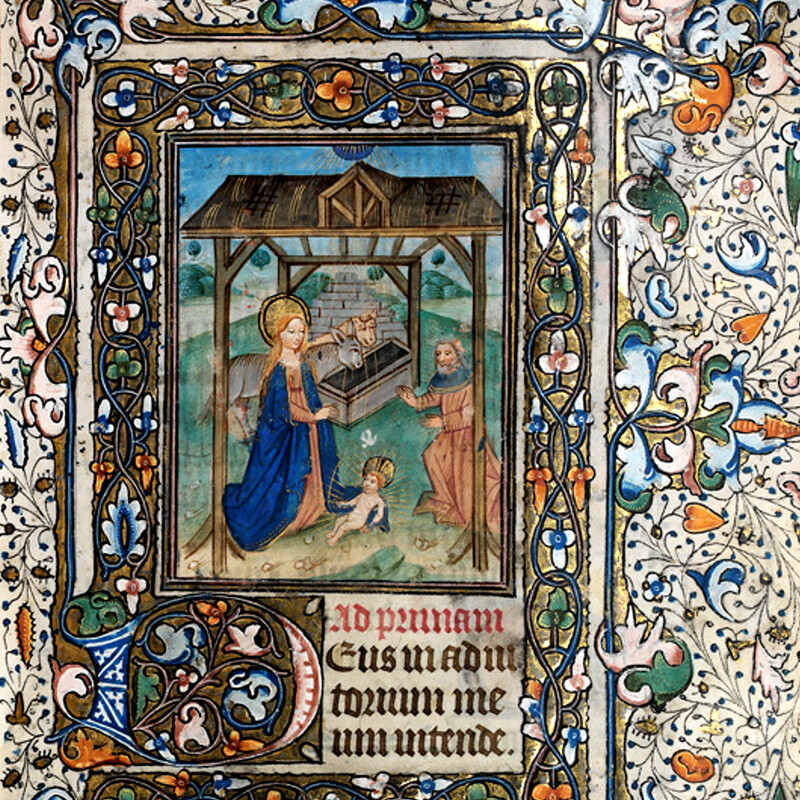 Books of Hours were the most popular texts of the Middle Ages and the Renaissance in Western Europe. They range from exquisite and highly decorated volumes to modest texts devoid of illustration. Tens of thousands were created as commercial ventures, and thousands survive today in libraries, museums and private collections throughout the world. Follow us on Twitter, Facebook or Instagram to find out what else we have in store for you! Grand hall of the Grande Bibliothèque du Québec, Montreal; April 2005. Photograph and compositing by Montrealais. In 2004, almost a hundred years after the founding of the National Library of Wales, the Quebec government passed an act which amalgamated the collections and services of the national library and archives with a public library facility, to create the Bibliothèque et Archives nationales du Québec (BAnQ). Over the summer I visited BAnQ for a book history conference, and learnt that the design of this iconic glass building in the centre of Montreal represents a key element of BAnQ’s mission statement. BAnQ aims to engage with the people and culture it represents by actually showing the public what is going on inside of the building. The key phrase I kept hearing was: the library is in the city, but the city should also exist within the library. The National Library of Quebec was actually created in 1967 at a key time in Québécois history known as the Quiet Revolution, when a surge of French-Canadian nationalism caused major socio-cultural change. 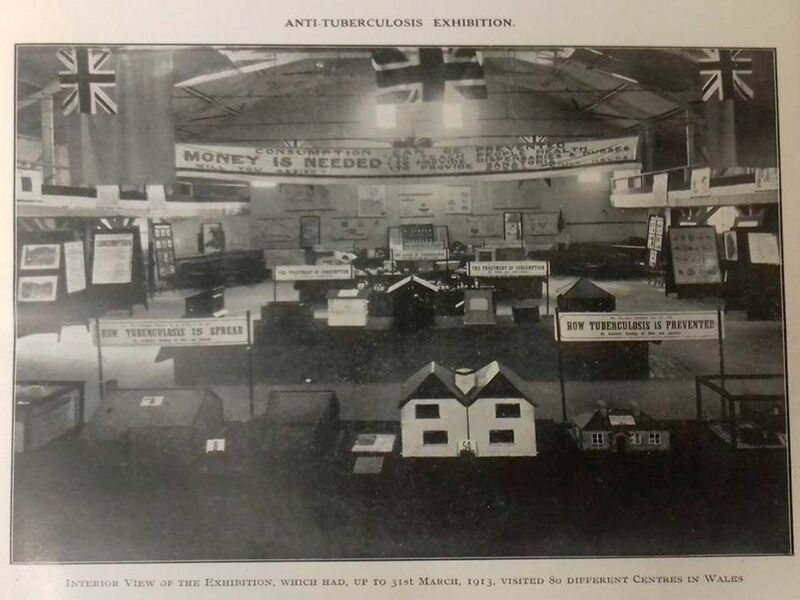 This period is not dissimilar from Wales in the late nineteenth century, when a surge of Welsh nationalism became a political force, enabling institutions such as the National Library of Wales to come into being. A visually austere library, the National Library of Wales is a product of its time and was deliberately built on a hill away from the hustle and bustle of city life. However, the purpose and function of both libraries is fundamentally the same: to collect, preserve and disseminate publications and archival material relating to a particular nation or group’s culture and heritage, previously underrepresented by their designated national libraries. Calista Williams is an AHRC-funded doctoral student, about to begin her third year of study. Her PhD is part of an innovative collaboration between the Open University and The National Library of Wales. Thomas Pennant is one of those authors who seem to remain popular and relevant. His prose is beautifully crafted, so that he is often quoted. In fact he is probably best known at second hand rather than first. As a polymath, Pennant was one of the classic 18th century scholar gentlemen who could spend their energies researching and discovering, visiting and touring, writing and reading. His was an almost scholastic existence of gathering information and publishing findings. The Library recently acquired a letter by Pennant written on 17 August 1764, (NLW MS 24045F) we are not certain who was the recipient, but evidently one of his scholarly circle. This letter allows us a rare insight to Pennant’s life, which is worth noting and exploring. His first wife died in 1764 and this letter represents his response to a friend, as he recovers an interest in collecting and sharing information. Remarkable is the amount and the detail of material that he was able and willing to share. The writer also shows us how drawings were shared on particular subjects and how he promoted and expanded his publishing interests. Pennant is seen, through this letter, as a person full of ideas and energy; with a clear vision and focus in his work. Another point of real significance is that he notes that that the previous year he had offered to purchase ‘a certain number of original drawings… which are to be sold for a quarter of their original value’. Pennant was one of the great 18th century collectors of drawings, certainly within Wales maybe the person who safeguarded some of the most important works on paper of Welsh antiquities and landscape. But why do we purchase one letter? It forms part of a much larger body of material written by Pennant and it adds a sense of the urgency with which he undertook his research. Seeing the handwritten text with crossing out and smudges gives us a sense of the process of thinking: Pennant wrote with ease and confidence, thinking as he composed his prose, so we get the feeling of something fresh and alive. We are witness to his life as a gatherer of facts and material: always on the look -out for new things. Pennant’s letter, written in the summer of 1764, opens a window on the life and work of one of our most influential authors of topography and wildlife. It sends us a message, that even in adversity, the person who is determined can overcome their circumstances and develop their career successfully. Yes, he had vast resources, but he also had the will to learn which we can all acquire and nurture. To coincide with the exhibition “The Secret workings of Nature: Robert Hooke and early science” a lecture entitled “Thomas Pennant: the leading British zoologist after Ray and before Darwin” will be given by Dr Paul Evans at the Library on Wednesday September 2nd at 1:15 p.m. Excuse me! Can I interest you in some NLW Data? NLW Data is a new initiative from NLW Research that will offer a new way of accessing some of our collections. NLW Data will focus on providing direct programmatic access to the various types of data held by the National Library of Wales. As a result users will be able to download datasets. This makes it possible for users to use their own software tools or to query datasets programmatically (for example as Linked Open Data or via APIs). The first dataset released in this way is the result of transcription work by the NLW Volunteer Programme that enabled certain portions of the Aberystwyth Shipping Records Archive to be made available as Excel Spreadsheets. To find out about more about this specific collection, see this blog post. To see an example of one of the crew lists click here. To download this dataset go to NLW Data.